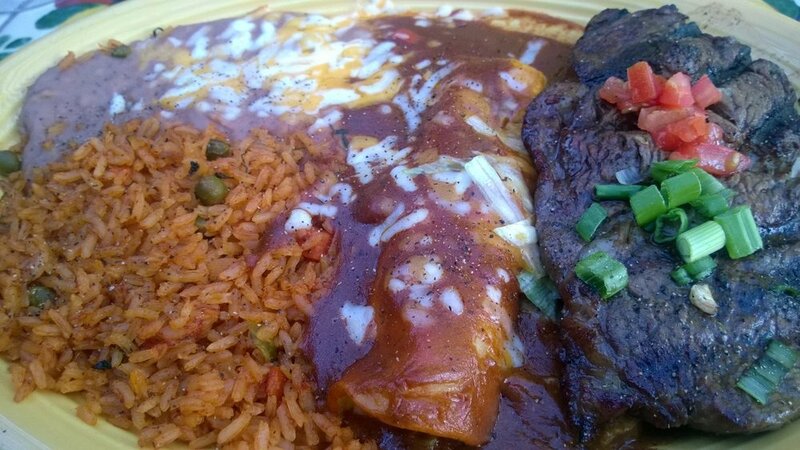 Don’t confuse this eatery with the one called El Encanto in the town of Cave Creek. The name, El Encanto should actually be El Encanto Turista. The sign must have broke off due to the amount of people and noise. Plus the chefs must be brothers from different mothers as the food is quite similiar but totally two differnt tastes. The best place is Dos on Carefree Highway heading west to I-17 right around 12th Street. This place has pretty good food – but the service needs to work on consistency. I’ve tried eating here several times to quench my enchilada craving and each time its different. Try any of the soups. Send it back if its cold. I did. Probably the best red beef enchiladas I’ve ever had but our server gave me the stink-eye when I told her that they hadn’t thawed the soup entirely. My lunch was pretty good! Damn good in fact. We enjoyed our time and our food. The manager was continually concerned about the time we were having. I ate too many chips and beers as usual so I toned downed to only one enchie as the plates here can be huge. The server was nice. I like sitting on the patio when the experience doesn’t give you heatstoke from the weather. Our waitress was decent but way too many tables kept her running. Just decent not great. This pony could outrun most of the field if would just learn to pay attention to the race and know it’s going to have to change lead at the right time to ever become a great runner. For that, I’m giving it 3 stars. The food was good and the prices are reasonable. The portions are huge so the lunch size is just right. Inconsistency is this horse’s name still deserving of a trio of runners.